When it comes to diet and acne, understanding how the inflammatory response affects the skin is knowledge worth knowing. Inflammation is a natural response by the body in an attempt to protect itself from foreign irritants, such as bacteria, chemicals, or even foods that one’s body may be inclined to reject. Inflammation is a common part of the healing process and usually subsides once the foreign element has been addressed. In terms of acne symptoms, an inflammatory response can result in red, swollen bumps on your face that are often painful and irritating. One way to combat an over-stimulated inflammatory response is to consider the foods that we put into our bodies. In terms of diet and inflammation, restricting inflammatory foods is just as essential as adding anti-inflammatory foods, and should be one of the first changes we make to our eating habits. Avoid processed foods, which include meats containing nitrates or other preservatives, baked snacks, refined grains such as white flour, and anything with a high sugar content. High-glycemic foods, known for increasing blood sugar and hormone levels, may result in the overproduction of sebum, an oily substance that, in excessive amounts, can lead to clogged pores. The clogged pore can accumulate dead skin cells, which may lead to an inflammatory response as the body works to fight off what is essentially a bacterial invasion. The acute response results in pustules and prolonged inflammation and can lead to bumps under the skin called cystic acne. It’s not uncommon knowledge that dairy, gluten, trans fats, and sugar, among other culprits, can lead to changes in the body, which may aggravate acne symptoms. What many people don’t consider is that, while certain foods can contribute to the formation of acne, others can effectively work to avoid an imbalance of hormones, lowering the possibility of an impact on the sebaceous glands. Here are some of our favorite food items to add to your side dish selection this holiday season. Like many orange foods, sweet potatoes are rich in vitamin A and manganese, which can both work to help improve acne, and make for a tasty and healthy alternative to the traditional mashed potatoes that are full of sugary starches. To make, simply boil until soft, then mash with non-dairy milk and a little butter and cinnamon – add salt as needed too. This simple side serves as a double-dose of acne-fighting vitamin C and E, and makes a tasty addition to any plate. To create, simply place beans in a large pot and cover with water, cooking on a stovetop until you reach a boil. Reduce heat to medium-low, cooking for another five minutes. While the beans are cooking, combine some olive oil, diced onions and garlic, broth (whatever you have in the house) and slivered almonds in a pan over low heat for approximately five minutes or until the almonds are golden and the onions a bit translucent – add a little salt & pepper if needed, and combine with strained green beans in a dish to serve. This traditional side calls for honey for two reasons: to avoid added sugar, and to implement a healthy dose of naturally occurring anti-inflammatory properties. Pick up a bag of fresh cranberries (which usually have instructions on the back of the bag), par boil in water first, then transfer to a pan with some water and honey (and orange for a little zest). As an added bonus, you can use any uncooked berries to create an exfoliating cranberry scrub to be used as a facial mask for a quick pick-me-up amid all the commotion. Another orange delight, squash is loaded with pretty much all the essential nutrients healthy skin needs, and when enhanced with rosemary, sage and/or garlic, can work to improve circulation and combat inflammation from the inside, out. You can use any variety of squash, but we like winter squash for this particular dish. To make, toss cubed squash, minced garlic, chopped sage and chopped rosemary with a bit of olive oil. Spread evenly onto a baking sheet and cook at 350F for about 90 minutes or until squash feels tender in the center before serving. For anyone with a sweet tooth to satisfy, this healthy dessert is a must-have for anyone with acne-prone skin. Using seasonal fruit, Omega 3-rich walnuts and antibacterial honey, check out the original recipe here! Making healthy eating choices to benefit your skin can be easy with a little insight and time for planning. The best rules of advice to follow are to avoid high-sugar items and ingredients when possible, and making sure to choose the right fats to cook with, such as coconut or olive oil. When it comes to holiday mealtime, sometimes things aren’t always as easy as sticking to our game-plan, especially if we’re invited as a guest, which is why it is so important to have a plan that is always working from within, regardless of what you have on your plate. 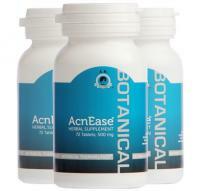 AcnEase® works from within the body to help prevent the sebaceous glands from overproducing sebum, an oily substance that can clog pores in excessive amounts. Using all-natural, herbal ingredients, AcnEase® is gentle on the skin and body, and is safe for use among people of all ages, with no side effects! Treat yourself and your skin to a healthy dose of healing from within with AcnEase® this holiday season! We want to hear from you! What are some of your favorite acne-friendly foods to cook up for the holidays? Have any yummy recipes to share? Tell us in the comments!